Kaga Yasai: Aka-Kabocha with Sesame Sauce – I'll Make It Myself! This article will be featured in J. Festa August 2011 edition: “Food in Japan,” hosted at japingu. Traveling around Japan has really widened my understanding of Japan’s local foods. For instance, because dried apricots are nearly impossible to find in my bayside town, I assumed that there were no apricots to be had in all of Japan. Then I went to Nagano, where basically everything delicious is, and, lo and behold, there were apricots everywhere! Now, if KitKat wanted to roll out some Hokuriku Pride kitkats, it ought to start with the Aka Kabocha (赤南瓜, red kabocha squash), a.k.a. the Utsugi Akagawa Amaguri Kabocha (打木赤皮甘栗かぼちゃ, Utsugi [Town] Red-Skinned Sweet-Chestnut Kabocha). This squash is one of the 15 Kaga Vegetables (kaga yasai, 加賀野菜), vegetables cultivated in the old province of Kaga, southern Ishikawa. Unlike a regular kabocha, which resembles a pie pumpkin more than a jack-o-lantern–sweet orange flesh, edible green skin–the red kabocha has orange skin. In fact, according to the Kakiichi Web Shop, a website about the seasonal vegetables of Hokuriku, which has the page “Mini Lessons and Recipes” for aka-kabocha, this squash is related to the Western buttercup squash. Available from June to September, the aka-kabocha is cultivated in Utsugi-machi, Kanazawa. 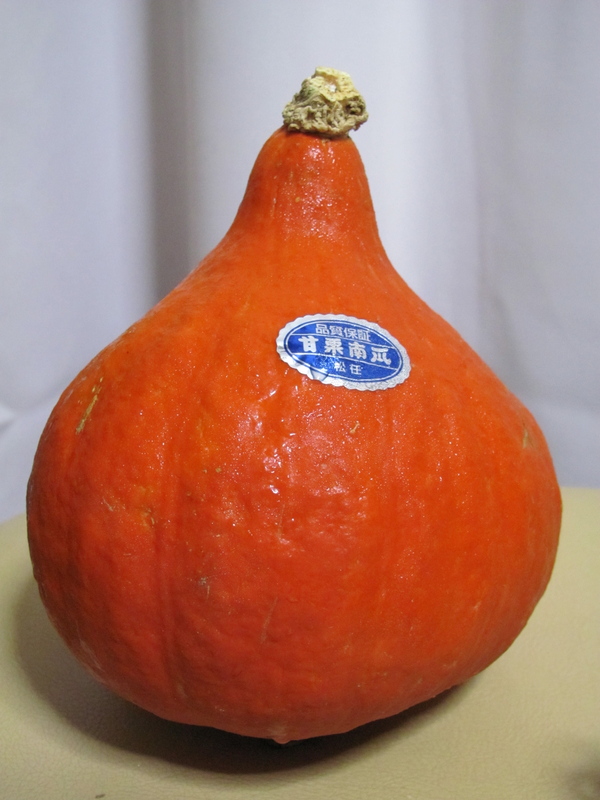 I acquired one of these beauties near Kanazawa, and set to work looking for a recipe that would be The Most Delicious Way to eat this squash. 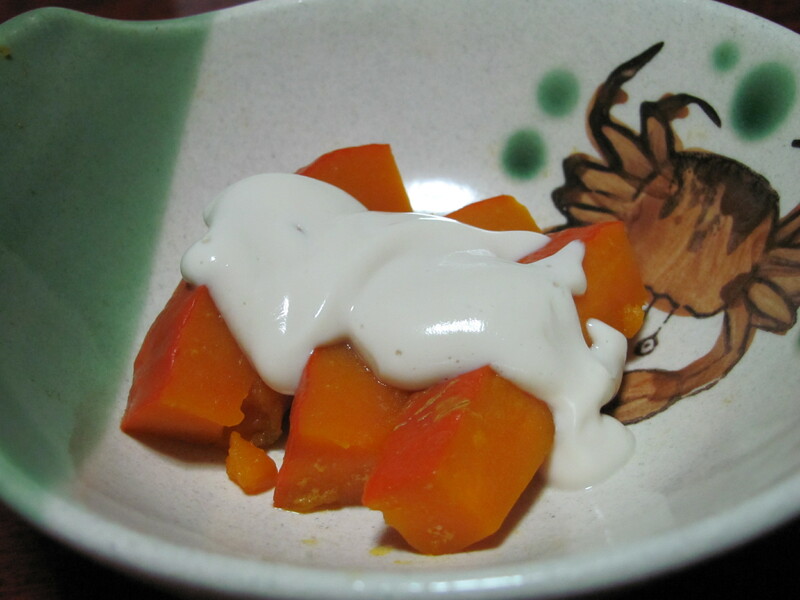 I adapted this recipe from “Aka-Kabocha with Sesame Sauce” on the Kanazawa Kaga Yasai site. The sesame sauce is optional, really, as the kabocha is exquisite without it. This does make quite a lot of boiled kabocha, but you can add the kabocha and/or sauce to salads to add a little variety. I’m certainly not getting sick of it, but you could also halve the recipe. Crab-san brings you 1/3 of a serving. As for the flavor, I love regular kabocha and would eat it every day in everything if I had my way. Aka-kabocha is even better. Somehow, the flesh is more tender, more flavorful, and boiling it nimono-style in a simple mix of dashi, soy sauce, and sugar gives it amazing umami. Unlike the kabocha no nimono I usually make, this tastes great cold, too. Maybe vegetables really are nature’s candy? Adapted from Kanazawa Kaga Yasai. 1. Wash the aka-kabocha. Cut open and scoop out the seeds. Leaving the skin on (otherwise it will fall apart), cut into ~7cm x 3cm pieces (about the size of a finger). 2. Add dashi to a pot and boil. Add aka-kabocha and gently boil until it softens a little. 3. Add the soy sauce and sugar and simmer on low heat until the aka-kabocha is fork-tender. 4. Drain stock. Serve hot or cold as is, or with sesame sauce (below). 5. Store in an airtight container in the refrigerator for up to 5 days. 1. Drain the tofu. Wrap in a paper towel and set under something heavy (a full tupperware container or a jar of jam) for ~10 minutes to drain further. 2. Place tofu, sesame paste, dashi, soy sauce, and salt in a blender, and blend into a smooth paste. 3. Place ~1 Tablespoon on top of the aka-kabocha (above); may also be used as salad dressing or dip with the lettuce, carrots, cucumbers, etc. *I mixed 1 part white dashi concentrate (shiro-dashi, 白だし）with 9 parts water. **If you just have regular soy sauce, use 2 Tbsp soy sauce and 2 Tbsp water. Pingback: Aka-Zuiki Quick Pickles (Red-Taro-Stem Vinegar Pickles) « I'll Make It Myself! Pingback: Japanese Street Food and Foodpia Land 2012 (フードピアランド2012) « I'll Make It Myself! Pingback: Roasted Autumn Salad with Quinoa (or Rice) « I'll Make It Myself!